The definitive list for the best weightlifting shoes for squats, powerlifting, weightlifting, and much more! One of the more important decisions a lifter can make is what type of shoes they choose to lift in. Weightlifting shoes/lifting shoes, or lifters, are becoming increasingly more popular among all strength sports for their abilities to support an athlete’s performance. Over the last two years, we’ve been on a mission dedicated to reviewing and ranking the industry’s top lifting shoes. We looked at both older and newer models from some of the biggest companies that have built strong reputations in the market. For the newer lifter, and even the weathered athlete, finding the perfect pair of shoes can be a daunting task. 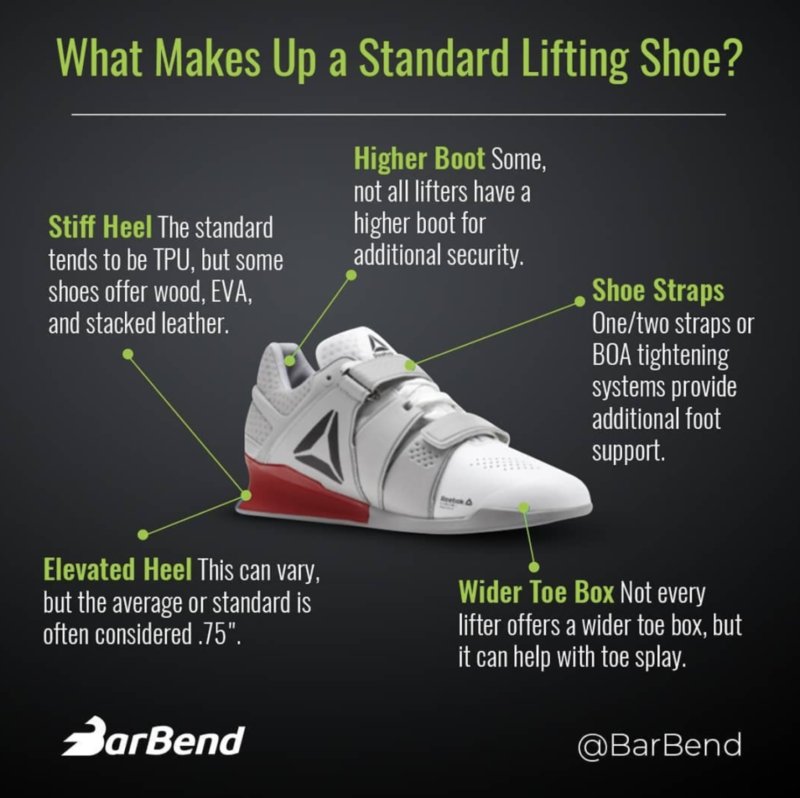 Lifting shoes are designed to increase a lifter’s stability, support mobility, and enhance platform feedback. They’re composed of multiple features that benefit the above three categories, and these characteristics are what make every shoe slightly different and individual for an athlete. We’re not saying you absolutely need lifters to perform well, but they’re something that can help push your lifting to the next level. Generally, there are five main shoe characteristics that make every pair of lifters different than a regular pair of sneakers. Additionally, things like a lifting shoe’s heel height and type, and lacing/strapping system offered can be major players in assisting you with your decision. A lightweight versailte lifting shoe with .6" heel made of high density EVA foam. A lightweight lifting shoe that utilizes Nike Flywire, a .75" TPU heel, and large single mid-foot strap to support performance. 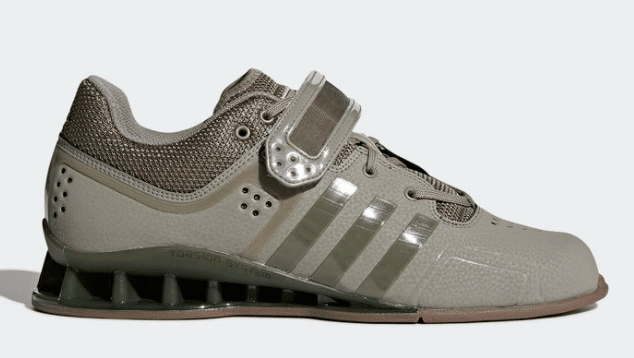 A consistent weightlifting shoe that offers the Adidas TORSION System through the mid-foot with a .75" TPU based heel. A weightlifting shoe that offers a sythetic weave outer construction, 1" TPU heel, and BOA lacing system. 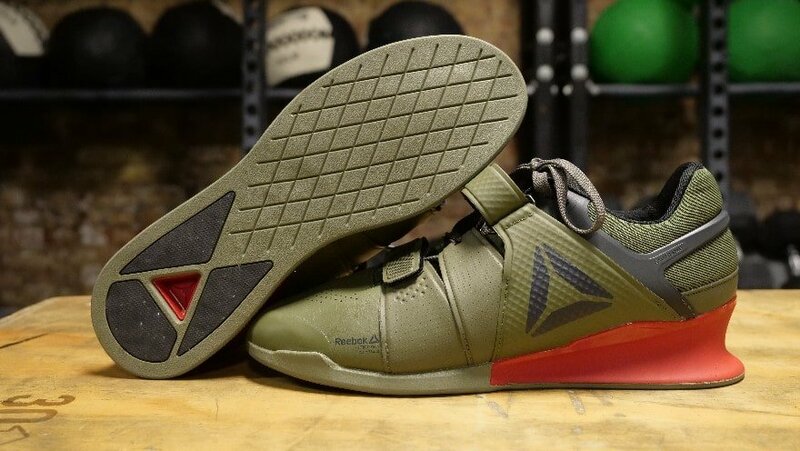 Reebok's signature weightlifting shoe that provides a strong TPU heel and double mid-foot straps for security. A wider built weightlifting shoe that offers double mid-foot straps and a solid .75" TPU heel. Luckily for you, we’re lifting shoe fiends (call us lifting shoe sneakerheads), and took the time to analyze every single aspect that comes with some of the market’s top shoes. 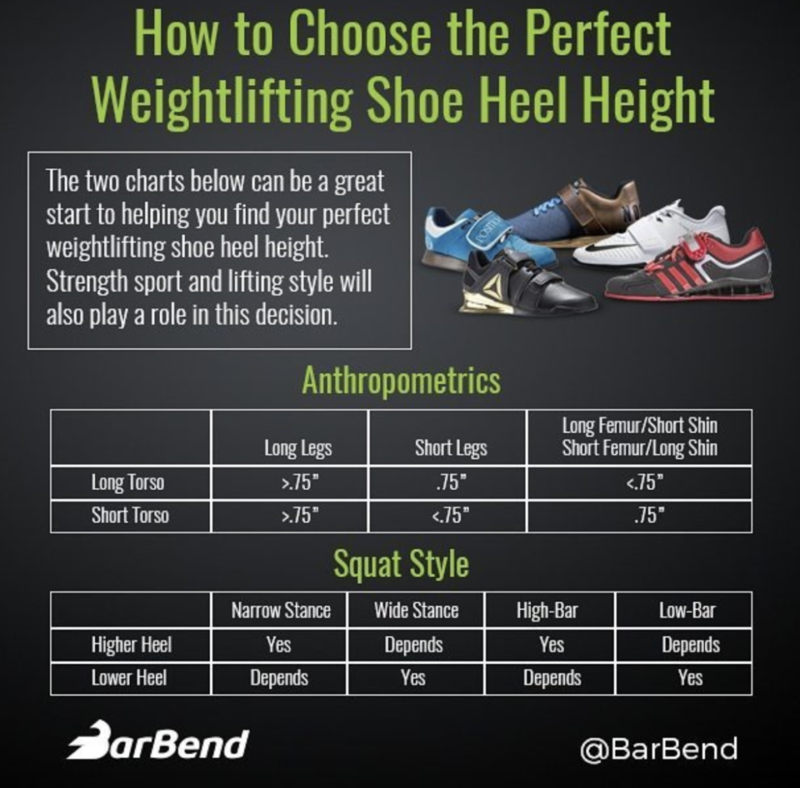 At the bottom of this article, we’ve also included in-depth info on the logic behind weightlifting shoes, along with popular points of construction and materials. The elevated heel on lifting shoes supports mobility and provides a stable base for lifters to sit back on. A planted stable foot is a must for athletes, especially when moving heavy weight, so a stable elevated heel can help a lifter to increase their confidence. A heel’s elevation can range from as low as .3″ – 1″, and every lifter will have a heel height that works best for them. This is dependent on a lifter’s sport and anthropometrics. Additionally, the extra heel height helps support a lifter moving weight through a variety of positions with optimal posture angles (easier to keep chest tall, knees track properly, etc). The table below can help give you an idea of which heel heights work best for different lifting stances and squat styles. The way a shoe laces, or straps can be a big deal for lifters who prioritize foot security. Of the shoes we reviewed, you’ll find single strap, double strap, and BOA lacing models. Each come with different levels of security for different areas of the foot. For maximal security, we found double straps and BOA lacing to top the list, but single straps also provide plenty of security. Regular sneakers have a compressible rubber-based heel, which is not ideal for catching, or moving weight. The lifting shoes we reviewed come in four different options: EVA, TPU, stacked leather, and wood. Each of these heels will have a different appearance, level of stability, performance, and feel on the platform. When it comes to deciding which heel is best for an athlete, it’s often up to a lifter’s preferences and discretion. Below are a few reasons a lifter might choose one of the four heels listed above. EVA Heel: Lightweight, somewhat compressible/maneuverable, and durable. TPU Heel: Lightweight, long-lasting, and resistant to abrasion and compression. Stacked Leather Heel: Old school appearance, lightweight, platform feedback. Wood Heel: Platform feedback, stable base, and old school appearance. Every shoe listed below in their respective categories was selected for a specific reason. The characteristics listed above, along with other factors like a shoe’s weight, are what helped us to divide each shoe into their “best” category. Believe it or not, weightlifting shoes have been studied on a couple occasions, although, not incredibly in-depth. The topics that have been researched have mostly been focused on the idea of how an elevated heel can alter performance and mechanics. Before diving into our favorite weightlifting shoe picks below, it’s a probably a good idea to look at the current research on lifting shoes. The first study we’ll look at comes from the Journal of Strength and Conditioning Research. In this research, authors assessed kinematic changes weightlifting shoes have on the barbell back squat (1). An elevated heel is often thought to promote mobility, but what did their research find when compared to a running shoe? From the study, researchers suggested that weightlifting shoes changed an athlete’s foot angle and forward lean, but didn’t change thigh angle to a high degree. They suggested that weightlifting shoes were seen to be beneficial when reducing forward torso lean, which can at times cause additional sheer stress on the lower back. Also, researchers suggested that weightlifting shoes could be useful tools to increase knee extensor activation. Another study from 2017 published in the Journal of Strength and Conditioning Research sought out to explore the same idea of how weightlifting shoes impact trunk and leg mechanics in the back squat (2). For this study, researchers noted that this topic was lacking research and they wanted to challenge the idea that weightlifting shoes led to a more upright torso in the squat, which has been suggest to protect the back from injury. In their study, authors took 14 recreational weightlifters who ranged from the ages of 18-50 and had them squat in three different conditions: Barefoot, with an elevated platform, and with weightlifting shoes. They performed a 3-D motion analysis and tracked the EMG activity of the knee extensors and the paraspinal muscles of L-3 and T-12. Unlike the 2012 study, their research suggested that neither of the heel elevated conditions led to a significant difference in biomechanics, especially in respects to forward torso lean. They suggested that weightlifting shoes are unlikely to lead to a significant amount of back protection in the squat. Research Takeaways: When you consider both studies and how they assessed their participants it makes sense that they found varied results. Everyone will have slightly different mechanics based off their lifting experience, training history, and anthropometrics, so believing a weightlifting shoe will make a significant impact on lifting by itself is a reach. Our advice: Assess your body’s needs, your sport’s demands, and the different construction characteristics of each shoe to find the perfect fit. The first reason we chose the Adidas Powerlift 4 shoe is their EVA foam heel is a little lower, sitting at .65″. This makes them a great shoe for athletes transitioning to using lifting shoes for squats. Additionally, the lower heel will be useful for low-bar and high-bar squats, so they’re pretty versatile in the terms of squat functionality for multiple athletes. Lastly, we liked the minimalist design they offered, and thought the outside leather material made for a durable cost efficient squat shoe. The brand new updated Adidas Powerlift 4 offers a lightweight canvas outer construction, an open forefoot design, and a strong single strap for stability. Great in-between for multiple strength sport for those focused only on squats. Fair price of $75.00-$90.00, so it’s great for beginners and budget shoppers. The second shoe on our squat list is the Reebok Legacy Lifters. We felt the wide profile, heavier weight, TPU based, and double strap of this shoe made it a suitable option for anyone squatting. The heel is a little higher at .75″, so they may not be the best shoe for low-bar squats, but their weight gave them an “anchored” to the floor feeling. The double straps provided full foot security, which is a big plus when moving heavy weight. Wider profile with two secure and thicker leather straps. Firm TPU heel and thicker out construction. The Romaleos 3s .79″ heel height make it a good option for a variety of athlete’s mobility asks, and the heel itself is a solid TPU. There’s also a mid-foot strap that keeps the foot secure. This shoe’s construction runs slightly slimmer than other models, so we thought it would be a good match for female athletes with skinner feet. Lastly, this shoe is extremely light weight and comes in around 13 oz or 15 oz depending on the insole you choose to use. Slimmer construction, so it hugs the foot well and will match skinner feet. Breathable and flexible material that doesn’t too long to break in. Learn more in our full Romaleos 3 Review. The Adidas Powerlift 4 is the last pick on our list for female athletes. Female athletes may have good mobility to begin with, so a .65″ heel is often high enough to find benefit. In addition, the lower heel makes this shoe a more versatile option compared to some of the higher heeled shoes on the market. The EVA heel is also lightweight and durable with little compression, so it won’t feel heavy on a female athlete’s foot. Great transitional shoe from a flatter, or tennis shoe to lifting shoes. Durable construction and cost efficient. Read our full Adidas Powerlift 4 Review. The Adidas AdiPowers offer a lightweight durable TPU heel, so there’s minimal upkeep. Their upper tongue strap provides the ankle with additional support, and the leather/mesh construction make them breathable, yet rigid. It’s a good balance of stiffer, yet soft shoe, so athletes won’t need a ton of time breaking them in. We also liked that this shoe has stood the test of time and will be a solid durable option. Have stood the test of time for multiple years in multiple strength sports. Solid construction and TPU heel to support performance and durability. Learn more in our Adidas Adipower Review. 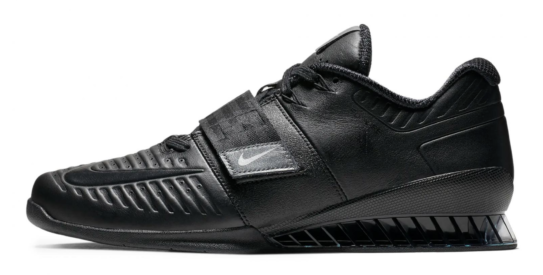 Our second pick for men is the Do-Win Weightlifting Shoe. We feel this shoe matches the needs of many male athletes for a couple reasons. First, it has a wider toe box, so full toe splay is easy to achiever no matter your foot size. Second, the double straps across the mid-foot provides ample support and stability. Lastly, the shoe comes in around $95.00, which is a great option for those shopping on a budget. Wider profile shoe with durable outer construction. Double mid-foot straps, strong TPU heel, and cost efficient. The Adidas Powerlift 3.1 pick for this category may seem a little unconventional, but hear out our reasoning. First, the EVA heel is a little softer than TPU, so cardio movements are a little more forgiving in this shoe. Second, the lower .6″ heel make it a good option for multiple activities. Lastly, it’s a decently light shoe and easy on the wallet, so you don’t have to stress as much with functional workouts that beat up shoes (rope climbs). High density EVA heel makes for slightly softer repeated heel impacts. Simple single-strap and durable design for versatile workouts. The Nike Romaleos 3 XD are adequate shoes for the CrossFit athlete due to their lightweight design and athletic fit. These shoes are very similar to the Nike Romaleos 3s, but have a few standout construction differences. The material around the tongue and the outer construction have both been improved to facilitate better durability with these models. The Nike Romaleos 3 XD have improved outer construction and increased material around the tongue to support durability. Improved outer and tongue construction to support durability. Mid-foot strap and solid lightweight TPU heel. 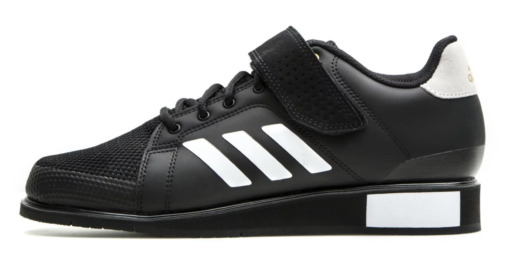 The Adidas Leistung 16.II shoes offer a higher 1″ heel, and it’s made with a lightweight TPU. The higher heel can beneficial when assisting an athlete’s ability to sit under weight with ease. Another defining feature of this shoe is that it provides the BOA lacing system. BOA laces allow a lifter to tighten the shoe fully at once with a crank knob on the tongue. These shoes also have a slimmer profile, so if you’re a weightlifter in need of a skinnier fit, then these shoes are a viable option. One inch heel provides solid base to sit back on for multiple mobility needs. BOA lacing and reinforced cross-weave construction supports durability. 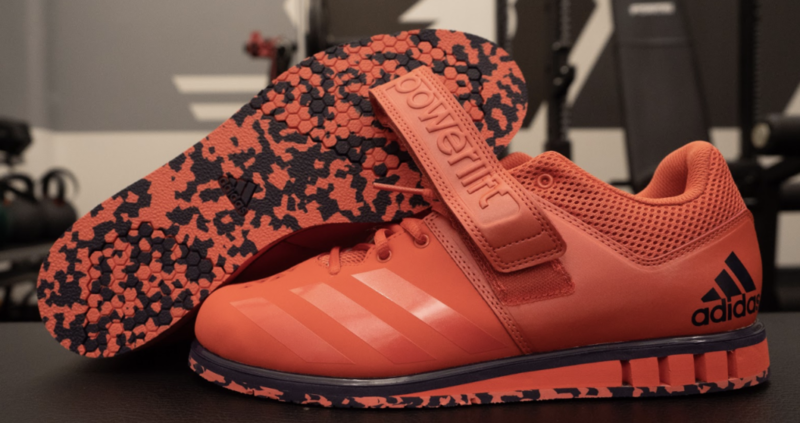 The Adidas Power Perfect 3 could be considered the gold standard for a solid weightlifting shoe. This model consists of a strong and durable outer construction and has everything you want in a well-built weightlifting shoe. The leather ankle strap provides adequate support and the high density EVA heel resists compression very well. The Adidas Power Perfect 3 consists of a high-density EVA foam heel, a firm outsole, and thick outer construction for a highly durable shoe. Non-compressible high density EVA foam heel and thick outer construction. Durable, consistent in the gym, and very cost efficient. The Reebok Legacy Lifters have a wider base, which make them comfortable, even for those with flat feet. Their toe box is pretty sizable too, so a lifter can fully splay their foot in catching positions without feeling the sides of the shoe press into the outer toes. We also liked the double straps these shoes offer, and how they held a flat foot securely at the top and bottom of the tongue. Wider boot to support a variety of foot sizes and toe splay. Reinforced leather construction and double straps to ensure no foot hang. Learn more in our full Reebok Legacy Lifters review. The Do-Win Weightlifting Shoe makes our number two spot for flat feet. These shoes are designed for the wider footed athlete, which is usually synonymous with a flat footed athlete (but not always the case). We liked the full foot wide profile this shoe offered and that the toe box has ample room for full toe splay. In addition, this shoe has double straps, so the flat footed lifter won’t feel like they’re losing any security. Wider profile shoe with larger toe box and durable outer construction. Our top pick for athlete with wide feet is the Do-Win Weightlifting Shoe. This shoe’s made wide on purpose and offers multiple benefits for the wide footed athlete. With its wide construction, the Do-Win shoe has multiple characteristics a wider footed strength athlete wants. The shoe offers a standard .75″ TPU heel, so it works with multiple athletes and is durable. There are double straps at the bottom and top of the tongue, which helped secure the full foot. In addition, the toe box is made a little wider so the toes can fully splay with ease. Designed with a wider toe box to ensure full splay is easily achievable. Double straps and solid leather construction to provide stability. Learn more in our full Do-Win weightlifting shoe review. The Reebok Legacy Lifters are designed to be wider to accommodate for full toe splay. This means that the forefoot and mid-foot for this model is slightly wider compared to other weightlifting shoes on the market. If you need a wider shoe with a slightly larger boot, then the Reebok Legacy Lifter is a good fit. 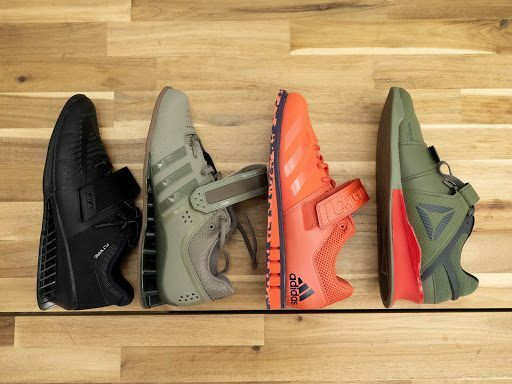 The Adidas Powerlift 3 starts at $90.00 and comes in multiple color schemes. This makes it a good option for athletes looking for a standard lifting shoe that’s easy on the wallet and has some uniqueness to it. This shoe may not last as long as some of the TPU heeled shoes, but we haven’t seen many complaints on early degradation. Also, the outer leather/mesh construction makes this shoe pretty resilient to abrasions. Fair price of $75.00-$90.00 depending on the color scheme. Solid construction for the money and great for beginners/budget shoppers. Learn more in our full Adidas Powerlift 3 review. A great pair of lifting shoes isn’t necessarily the newest model, but the model that fits the lifter best. There are so many models and designs out there, so a lifter should find it relatively easy to find their perfect shoe. Before investing in a new pair of shoes, make sure you know exactly what you’re looking for. It’s always a good idea to base your decision off of individual needs and preferences. Often the best shoes are the pair that fits your strength sport and anthropometrics best. Adidas Powerlift 3.1 all the way! 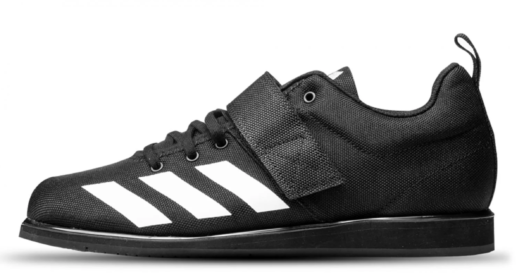 Although I do not use a lifting shoe, the Adidas AdiPowers look promising. I am dying to buy Adidas Adipowers but they are never in stock! 🙁 Don’t even try finding them in store! Reebok Legacy Lifters for me. They’re heavier, but I believe are more durable than the competition. I have an arched foot and they are comfy, so they’re not just for flat feet. I don’t wear them. Sorry. I don’t wear a lifting shoe, but if I did I like the Adidas Powerlift 3 for style and versatility. The Nike Romaleos 3 because it’s for women. I grew up squatting high bar, got a pair of Romaleos 2 to supplement my mobility for deep squats. I don’t wear lifting shoes. I’ve tried lifting shoes before I it definitely helps performance and posture. A lot of great info here for someone starting out. Thank you! Nike metcons for the win! I don’t wear lifting shoes but think I probably should start to with such a wide variety to choose from. I don’t currently have lifting shoes but would love to have the Reebok Legacy Lifter. The Nike Romaleos 3 look like a good shoe for me. Thanks for the reviews. Thanks for the help in picking out shoes for my husband who lifts! You provide a lot of valuable info and he is excited for your blogs so they help him!! Very informative article! I don’t currently use lifting shoes. I don’t lift right now, but if I did I would choose the Adidas Powerlift 3.1 because they are the best for crossfit.